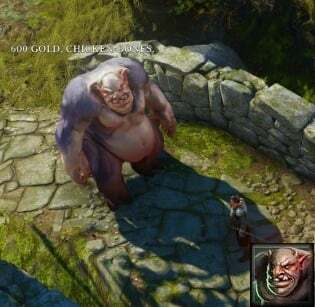 For Whom the Troll Tolls is a Side Quest in Divinity: Original Sin Enhanced Edition. The quest triggers when you reach a bridge southeast of the Phantom Forest Portal. At the bridge you will find Rumble (Troll) quarrelling with the Slave Master and his group. You can decide to complete the quest by paying, or by fighting them all. This path requires you to pay the toll then manually attack either the troll, slavers, or slaves after dialogue. Slaves will flee upon combat, but if killed by initiating AOE, or DOT effects (I.E. burning, poisoning, rot) they will yield experience.